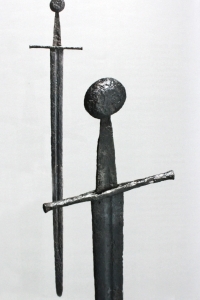 The transition from the Germanic to the swords of the Medieval period took shape between the 10th and 11th centuries. 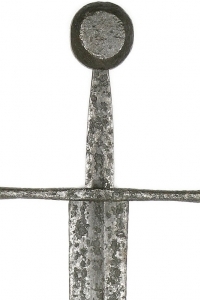 While the blade geometry remained relatively constant, the main changes were the introduction of the crucifix guard and transition into the wheel pommel which is now typically associated with the Norman swords as well as those of the later part of the middle ages. The Normans (also called Northmen or Norsemen) were the descendants of the Scandinavian Vikings who raided the European coastal settlements at the outset of the 8th century. Despite the Norman’s conversion to Christianity and their adoption of Frankish way of life, the Normans retained many of the traits of their Germanic ancestors. This medieval sword is historically bound to the Normans because of its frequent appearance in the Bayeux Tapestry: an embroidery that depicts the Norman Conquest. 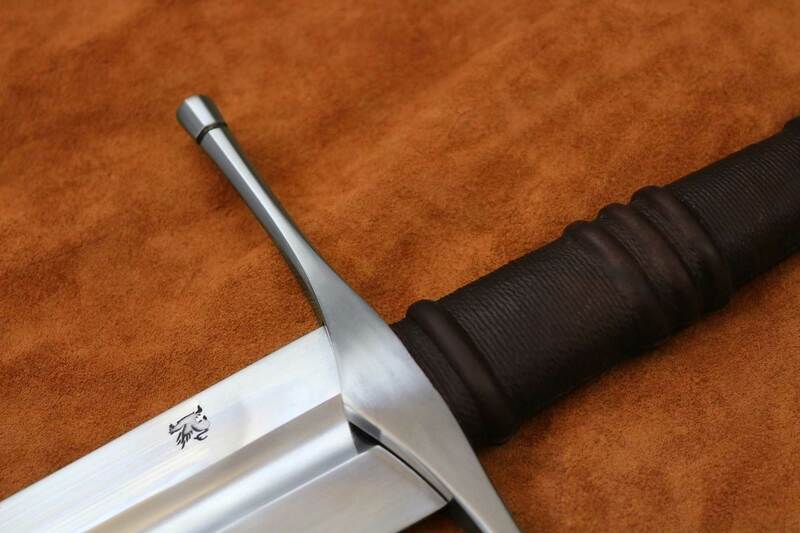 The Norman battle ready Sword, classified as type Xa by Oakeshott’s typology, is classically styled with the traditional wheel pommel and guard. The Norman Sword is finely engineered for the most discriminating collector. Designed for actual medieval combat, our staff conceived the Norman sword with a responsive, well balanced and resilient core. 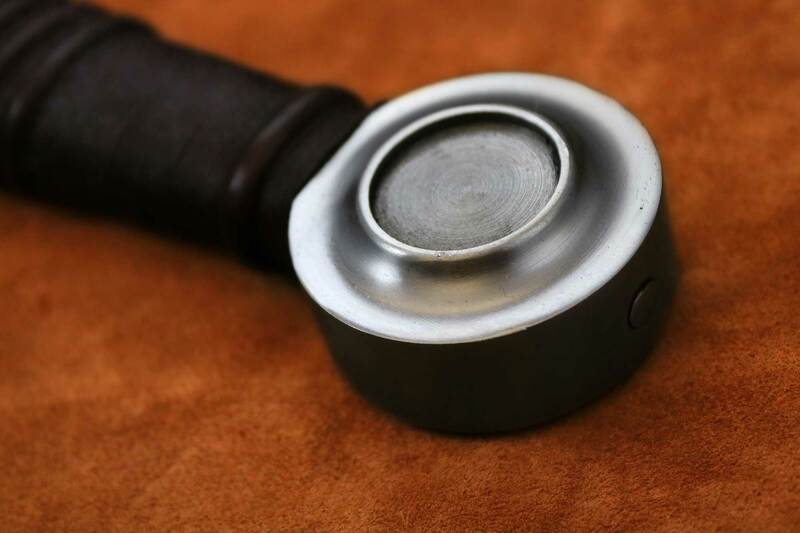 The hand-crafted blade, wheel pommel and guard have been designed from originals, conserving the authenticity and “feel” of the originals. The Norman sword is not a reproduction. 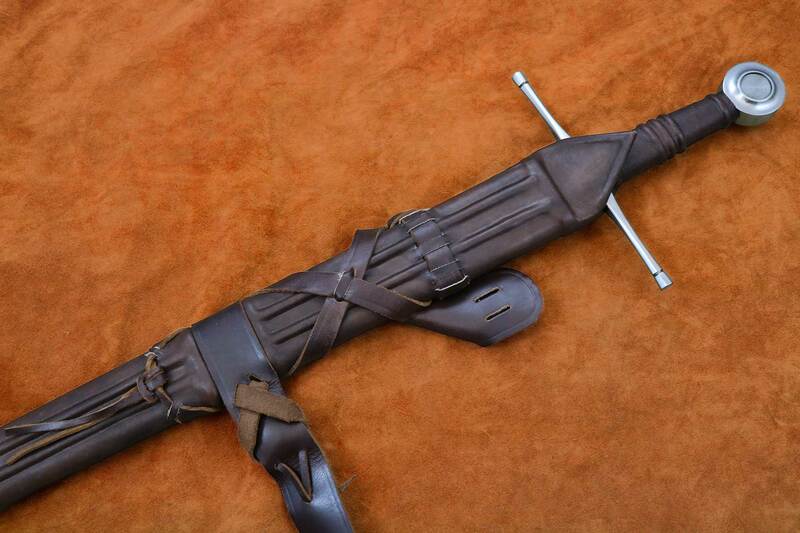 It is a recreation of one of the most important swords of human history. “I received my sword yesterday and I had to tell you how impressed I am !! It is everything I could hope for and more. Thanks for providing such a magnificent piece at an affordable price”. – Scott M. Florence Colorado. This sword is my first and its everything I thought it would be. 4 stars because of the gap between the blade and the cross guard. Other than that, its impressive. This is the second sword that I’ve purchased from DSA and I am very, very happy with it. It is perfectly balanced for a one-handed sword, with an absolutely beautiful blade geometry. I’ve got big hands and there is still enough room on the hilt for a modified two-handed grip, which I really like. To me, it’s the epitome of what a one-handed sword should be. it feels like holding a piece of history in my hand. Again, a very satisfied customer, and I’ll definitely be returning. "See, I grasp England in my hand". The Normans were a people who greatly influenced the development of Western Europe, famed for their innovation and culture. It may be surprising for people in modern times, though, to learn that the Normans were once called the Northmen or Norsemen – and were descendants of the Scandinavian raiders known as “Vikings.” Under the leadership of Rollo, a Viking raider, the Norsemen established control over an area of what would one day be known as France. Their control over this area was so absolute that they were granted ownership by Frankish King Charles III, called Charles the Simple, in 911 CE. The Scandinavian Vikings who raided the European coastal settlements at the outset of the 8th century had become not only landed immigrants, but title-holding nobility. The Norsemen adapted to their new circumstances, and quickly, as Rollo himself converted to Christianity at the urging of his Frankish hosts with his people soon following. The Norsemen – now firmly established as the duchy of Normandy – began advancing at an incredible rate. Art, architecture, music, politics – no area of Frankish culture was untouched by their influence. Normans became known as paragons of Christian virtue and Medieval nobility, Even the local language was changed, becoming known as Norman French. Despite the Normans’ conversion to Christianity and their adoption of Frankish way of life, though, the Normans retained many of the traits of their Germanic ancestors – including skill in battle and tactics. While many areas of Europe were invaded, conquered, or aggressively settled by the Normans (including the establishment of the Kingdom of Sicily), there is no more famous military venture than the 11-th Century Norman conquest of England. William the Conqueror, a Norman Duke, was a distant relative of Anglo-Saxon King Edward the Confessor. Upon Edward’s death in 1066, William led a train of cavalry, archers, and foot soldiers in an invasion of the British Ilse. They soundly defeated the gathered Anglo-Saxon army during many famous encounters such as the Battle of Hastings. William spent the next six years establishing his reign in Britain through granting of land and title to the Norman nobility who accompanied him and the construction of castles throughout the land. The influx of Norman culture into the Anglo-Saxon regions caused vast changes in the lives of both groups, and still influences the inhabitants of modern Britain today. 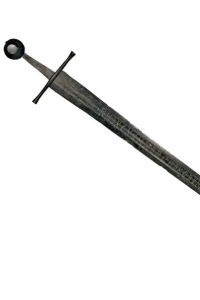 The Two handed Norman Sword, is an excellent example of the quintessential medieval sword. Known for its crucifix form, it is a classic design that has both many surviving replicas and depictions in period artwork. 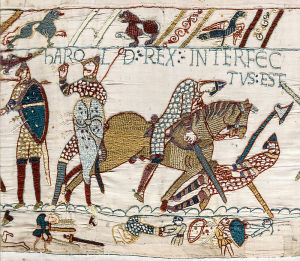 This design was famously presented in the Bayeux Tapestry: an embroidery that depicts the Norman Conquest. 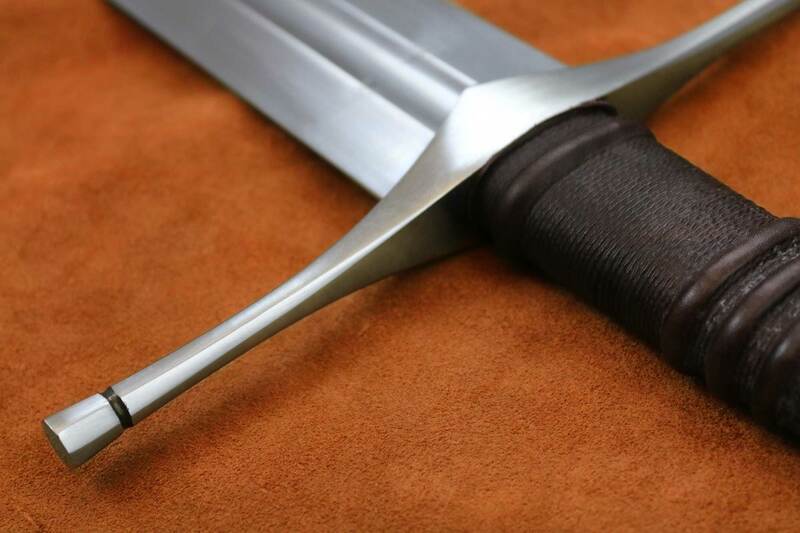 The Norman Sword, classified as type XI with elements of type XIIa, is elegant in its simplicity. Working on the Two Handed Norman Sword was a Challenging endeavor. 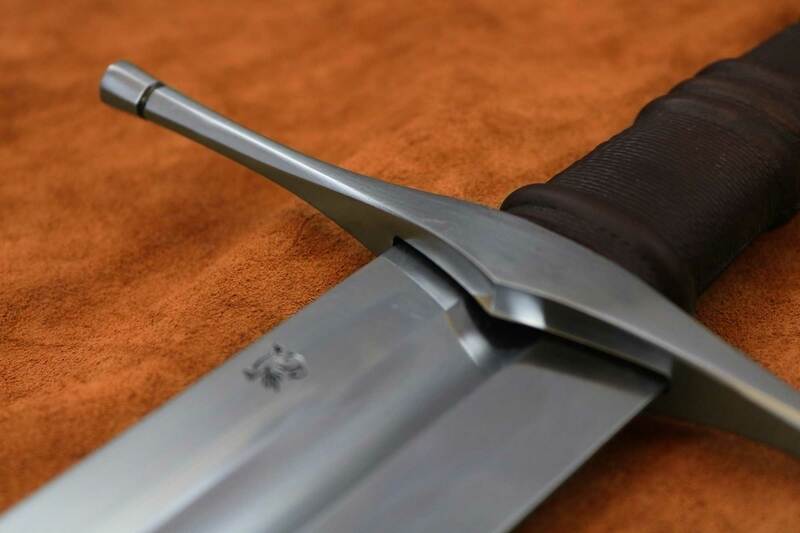 Given the historical significance and popularity of Norman swords, the artists at Darksword Armory opted to recreate a Two handed version of the traditional single handed Norman swords depicted in the Bayeux tapestry. The Guard, being very symbolic, served not only as a cross for praying prior to battles and ceremonies, but also as a counter block in combat. The Guard, individually crafted from mild steel and finely shaped with smooth octagonal lines, is further accentuated by the decorated leather wrapped Oak handle. 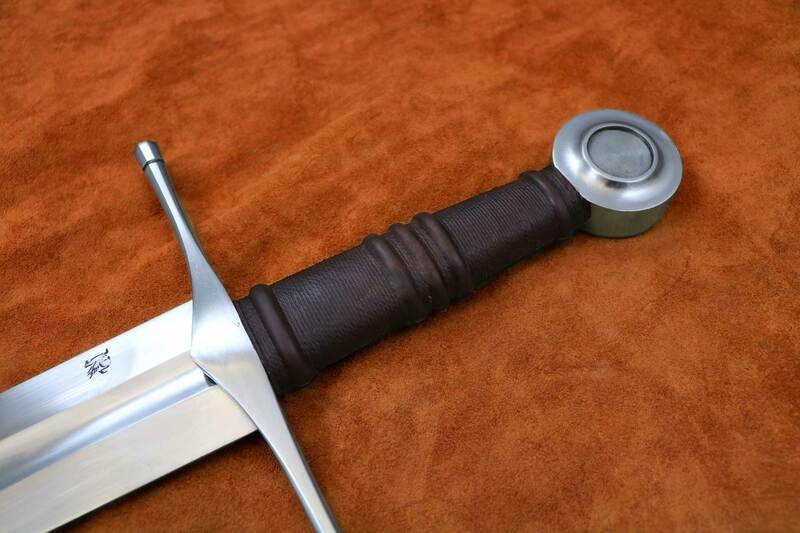 The two handed Norman sword is not only one of Darksword’s best sellers, it is one of the top “Staff picks” in their collection. 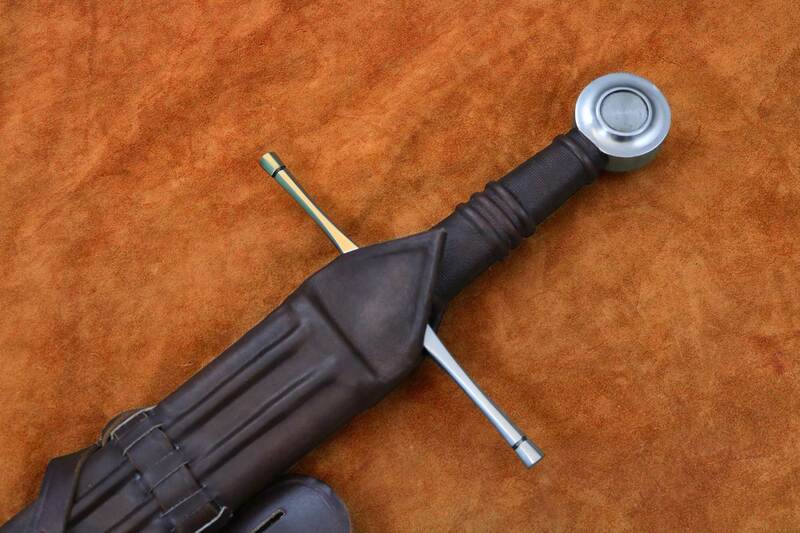 Hand crafted and properly engineered for durability in combat, the Two Handed Norman sword, is a very solid, responsive, and perfectly balanced weapon. 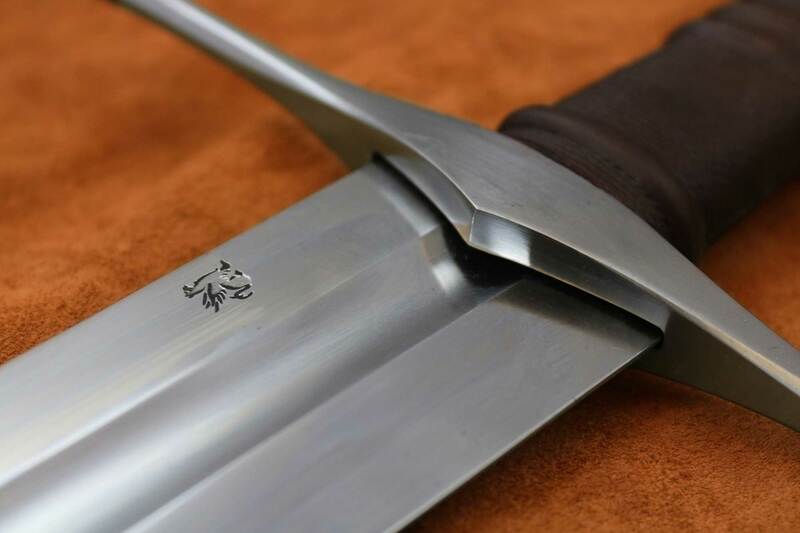 The blade, hand forged with 5160 High Carbon Steel, is skillfully Dual Hardened for precise cutting while remaining flexible for enduring combat.